Invite your guest list to join you Venetian Carnival style! 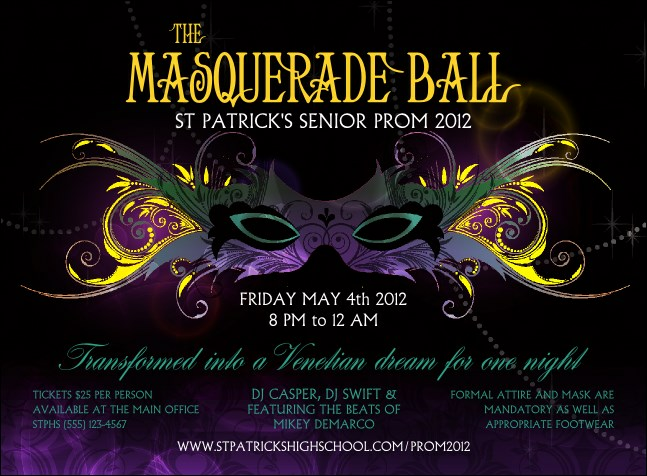 Fashionable Masquerade Ball Invitations are the perfect way to personalize your pre-event advertising. Featuring an intricate mask with bright yellow feathers and almond-shaped eyes on a unique purple background, these Invitations are enchantingly festive. It’s easy to promote your fancy occasion with Event Kits from TicketPrinting.com.